Having a printer at home can be very handy, especially if you often find yourself having to constantly run to a friend or a print shop to get something printed. Not only does having a home printer give you full control of the kind of quality you want for your prints, it also saves you a lot of time and effort in the long run. There is a downside to having a printer of your own, however, and that’s mainly about how expensive printer ink can get these days. While nothing can hurt more than running out of ink in the middle of a huge and important printing job, paying for a set of brand-new cartridges can come very close to that kind of pain, especially if you’re already having problems balancing your household budget as it is. To help you avoid that sting, here are some surefire ways to save printer ink at home. One of the best ways to save printer ink at home—at least, the expensive kind—is to stop buying brand-new cartridges from your printer’s OEM altogether. Instead, buy generic ink cartridges from online printer ink cartridge shops. These ink cartridges are made with the much the same kind of materials and build quality as branded ink cartridges, and they’re filled with compatible ink as well. This makes them perfectly well-suited with the printer you have at home. The only difference is that generic ink cartridges are sold without the branding, which in turn makes them a whole lot cheaper. You’ll never have to feel the sting of guilt ever again when you switch to generic ink cartridges. Before hitting print, make sure to check and re-check your document for errors and formatting mistakes. Leaving typos and other errors in your final draft will result in you having to reprint the entire thing over again, wasting ink as well as paper. Use your word processor or image editing program’s preview and grammar check functions to make sure. If you’re printing something that only needs to be legible and not look that good, then use your printer software’s ink-saving features to minimize the amount of ink used on your printing job. Depending on the type of printer you have, this setting can be called EconoFast or Draft Mode. The end result are printed images and texts that may not look as good as they could, but gets the job done as far as having visible details or legible letters is concerned. The tradeoff here is that your printer ink cartridge will last for much longer, with its ink being saved for the more important print jobs later on. Are you the type to simply unplug your printer from its power source after you’ve finished with it, or do you simply leave it idle for the entire day? If so, then you might want to start developing the habit of turning it off via its on/off switch before unplugging it. This shutdown procedure makes your printer park the ink cartridge and cap it, thus preventing its ink delivery system from unnecessarily being exposed to air. This minimizes the amount of ink lost due to it drying out. Unless you do a lot of heavy print jobs at home, it’s a better idea to buy just enough ink cartridges to replenish your supply, and no more. This is because ink cartridges have an expiry date, just like many other consumable items. Buying one too many ink cartridges may cause you to have an oversupply, with some of your cartridges probably sitting unused past their expiry dates. These cartridges can be considered useless, as the ink inside them may either have dried out or become so full of built-up particulates that using them can cause your printer nozzles to clog. This results in you not only having wasted perfectly good ink but also damaging your own printer. 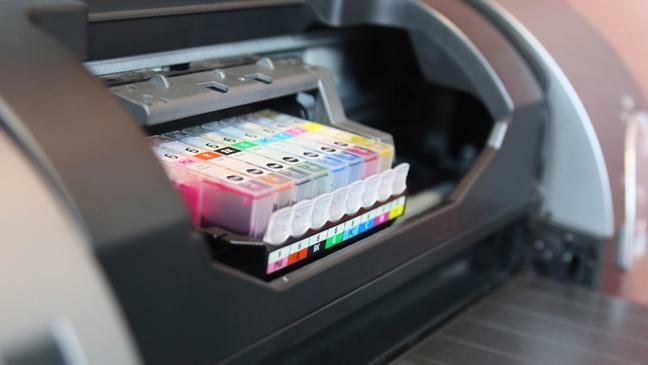 Give your budget a break by implementing these easy-to-do printer ink saving measures at home. Doing so will ensure that your printer ink cartridges will last for quite a while, allowing you to get as many print jobs done with them before another pricey resupply.